Just as Proust was carried back to his childhood by a madeleine dipped in tea, give me a well written Southern story and the long dormant taproot that connects me to the red clay of my ancestors awakens and tugs at my soul. 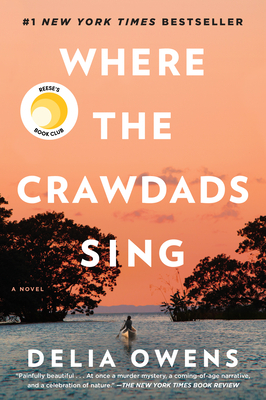 Where the Crawdads Sing by Delia Owens takes place in the North Carolina low country, but those of us raised on sweet tea and lumpy grits will recognize the scenes of marsh grass rustling and Blue Jay screeches as their own. Jumping back and forth between 1952 and 1969, we follow the story of Kya Clark as her large, impoverished family whittles away under the abuse of a drunken father (think Huckleberry Finn) until only the 10-year-old “Marsh Girl” is left in the ramshackle cabin at the edge of the North Carolina backwaters. Through trial and error and the help of a local black family that runs a dockside store, Kya not only survives, she thrives. Though never given a “proper” public education, Kya’s bright intelligence takes in the natural world around her and provides meaning amidst the isolation. Soon, two young men enter her Spanish Moss covered world. One will teach her to read and classify the birds, bugs, and plants around her. The other will awaken the yearning that exists in all humans. One of these men will end up dead. Although this is Owens’ first novel, her extensive resume includes many non-fiction works that cover her work in Africa’s Kalahari region. She received a BS in Zoology as well as a PH.D. in Animal Behavior. This love of nature shines through in her description of the North Carolina tidal areas and Kya’s detailed observations of the life there. It’s easy to imagine the black mud oozing between your toes as you watch a heron standing in the mist on one leg while it gulps down a morning frog. Like the South itself, Where the Crawdads Sing is both simple and complex. It’s a story that is as rich as a thick gumbo yet made from the most humble of ingredients. Afterwards, you’ll set the book down and be satisfied and nourished down to your soul.